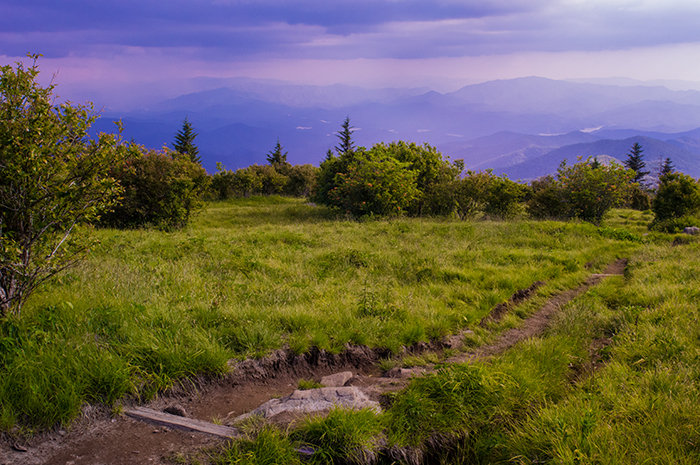 Andrews Bald in late June is a beautiful place to be. The azaleas bloom out and attract lots of hikers. Above, I show the trail as it weaves its way through this clearing to the great views beyond. However, this image almost didn't happen. About three-quarters of a mile from the trailhead, my hiking partner and I started to hear thunder rumbling in this distance. A storm was approaching but whether it would strike us head on I didn't know. We committed to finishing the hike -be it soaking wet or dry. Fortunately, the storm took a path that dodged Andrews Bald and instead provided a dramatic backdrop to the orange-red azaleas in bloom. Pressing ahead that day payed off with a great image and a great time.
. Photo © copyright by Jeremy Brasher.